These muffatees were based on observations of a pair of muffatees worn by a staff member at Old Sturbridge Village. When visiting the village, I happened to see a costumed interpreter wearing a pair of muffatees that looked intriguing and different from those I had seen in the past; I asked her what pattern she used. She indicated that she had based her pattern an original pair in the collection from the Village. Unfortunately, we were on our way out of the village and were not coming back in the near future. Next time we visit, we will try to request an appointment so that we can examine originals in the Old Sturbridge Village collection. The interpreter did not have the pattern written down so I looked at her muffatees and tried to replicate the ones she wore. 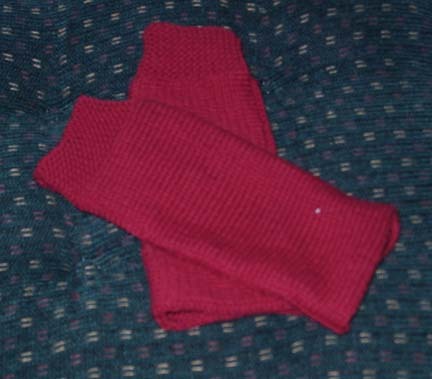 They are very similar to other muffatee patterns dating from the 1830s to the 1870s. 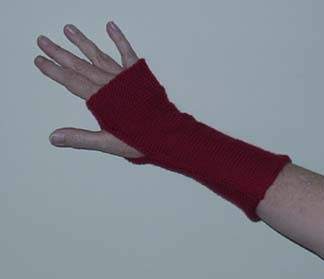 Some of the patterns instruct the knitter to knit in the round using four needles but the originals of this style were knit using two needles. Other muffatee patterns used a double knit stitch, which is simple, but can be confusing or intimidating for the beginner knitter. Since only two needles are used, for this pattern, and only the knit and pearl stitch is used, it is perfect for the beginner. To make the tube, the long edges are stitched up, and a space is left open for the thumb. Modern interpretation of the muffatee pattern. Yarn - 2 ounces of a light sport weight, such as Lana Gatto. Row 1. Slip the first stitch. Knit 9 stitches, place a marker. [This marker may be either a loop of yarn or some other type of marker.] Knit to end of the row. Row 2. Slip the first stitch. Pearl to marker, knit 10 stitches. Continue these two rows until you have reached a width that will go around the wrist. I made mine 8 1/2" inches long. Cast off. Turn inside out. Seam the sides of the garter stitch section and tie off the yarn. Leave space for the thumb and continue to seam the side to the end.